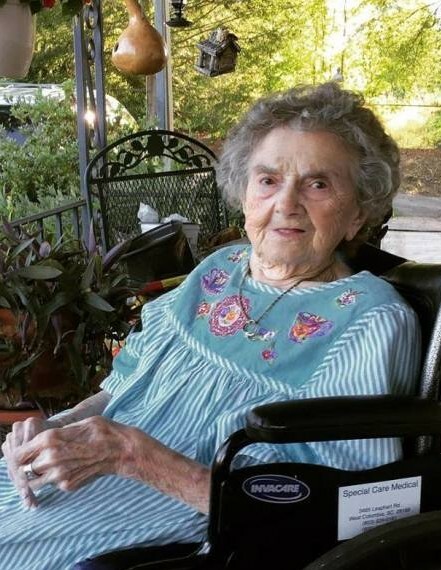 Nancy Hammond Butler, 91, loving wife of the late Robert D. Butler, Sr., of Travelers Rest, went to be with the Lord on Tuesday, February 12, 2019. Born in Greer, she was a daughter of the late Thomas A. and Pauline Duncan Hammond. Mrs. Butler lived a full life. She retired from 30 years after serving as the secretary for Magistrate Paul Vernon in Travelers Rest. She was a member of Locust Hill Baptist Church since she was in the 8th grade; active in all ministries at the church, especially the music and WMU. She loved singing in The Hammond Trio with her sisters, and was the loving matriarch of her family. She is survived by two sons, Bob Butler (Janice) and Lee Butler; two daughters, Deborah B. Plumblee and Delores B. Stansell (Mike); seven grandchildren, Tracy Parris (Jonathon), Bo Butler (Gwen), Tommy Plumblee (Beth), Leesa Plumblee Nelson, Tosha Stansell Webb, Allen Newton (Lindsay Burke), and Crystal Newton; eleven great grandchildren; and one sister, Polly Hammond Worthy (Morgan). In addition to her husband and parents, she was preceded in death by one son-in-law, John T. Plumblee, Sr.; two brothers, Tom and Herb Hammond; and two sisters, Martha Hammond Brown and Helen Hammond Huff. A visitation will be held Saturday, February 16, 2019 from 12:00 p.m. until 1:45 p.m. at Locust Hill Baptist Church with the funeral service to follow at 2:00 p.m. in the sanctuary. Burial will follow in the church cemetery. Memorials may be made to Locust Hill Baptist Church Building Fund, P.O. Box 759, Travelers Rest, SC 29690.